An electric motor or diesel engine is used to operate the compressor. Various methods are used in engineering for coupling the Air Compressor. Some compressors are run by tire coupling and some run by direct coupling. And also some run by V-Belts coupling. Many times customer phoned me about abnormal sound from the compressor when I reach to inspect, I found that sound is due to loose v-belts on pulley and belt wheel. So, here I will cover the most useful method of coupling for air compressor which has a capacity of 100 cubic feet/minute or above. In assembling the drive, the electric motor or prime mover should be moved towards the Air Compressor Belt wheel. The sliding rails are provided for this purpose. By this way, you can put the V-Belts in their respective grooves by hands. The allowance must be available for adjustment of centre distance. 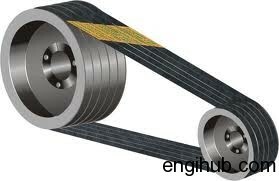 When V-belts have been placed on belt wheel and pulley grooves, the electric motor or prime mover should then be, moved away from the compressor, until to apply uniform tension to the V-Belts. Under no circumstances should V-Belts be forced onto the pulley or belt wheel with Crowbars, Wedges, Screw Driver or any other type of implement. Such procedure would tend to cause rupture to outside jacket or inside cords. It is possible for the inside load carrying cords to be broken by forcing over the grooves, such V-Belt will fail completely during the first few hours of running. 01) Measure the centre distance in between the compressor belt wheel and electric motor pulley (in meter). Multiply this distance by 16 to obtain the allowable deflection distance of belts in millimetre (mm). 02) Set the lower marking ring at the allowable deflection distance required in millimetre on the lower scale of Belt Tension Indicator. 03) Set the upper marker ring against the bottom edge of the top tube. 04) Place the belt tension indicator on top of the belt at the centre of spam, and apply a force at right angle to the belt-deflecting it to the point where the lower marker ring is level with the top of the adjacent by the top edge. 05) Read off the force value indicated by the top edge of the upper marking ring. 06) Compare this force value to the Kgf value in the standard table which is provided with belt tension indicator. If the measured force falls within the value given the drive should be satisfactory. 07) A measured force below the lower value indicates under tensioning and upper value indicates over-tensioning. Make corrections accordingly. 08) The new belts should be tensioned to the higher value to allow for the normal drop in tension during the running period of Air Compressor. 09) Run the compressor under load for 30 minutes, stop the compressor, and check the tension, re-setting to the required value, if necessary. 10) After the air compressor has been running for few days the V-Belts will have seated in the grooves and the V-Belts tension should be rechecked. Make adequate provision for tensioning the belts during its life. If you follow above procedure and rules of coupling then there is no doubt that you will get maximum life from your v-belts.